‘So much has been written on the Waterloo Campaign that, even in the smallest details, nothing new can be revealed’. So wrote William Hyde Kelly in his introduction to a book on elements of the Waterloo campaign in 1905; it is therefore with great trepidation that any historian treads this well worn path more than a century later. However, Kelly was wrong in his assessment for many reasons and numerous volumes have continued to appear about this battle at very regular intervals; nor is there any sign of this easing. Indeed, as we approach the two hundredth anniversary of the battle, this will only lead to an explosion of new works and hopefully greater public awareness and interest in a fascinating and vital period in the development of both Europe and Great Britain and its Empire. This whole period of history is unfortunately too often overlooked by schools today, and is shamefully ignored by the National Curriculum, causing a younger generation to underestimate its importance, if they ever get to hear of it at all. The national commemorations of the bicentenary of the battle in 2015 will undoubtedly be relatively muted as the British government are clearly loath to upset their European partners; although commemorations for the centenary of the opening of the 1914-18 conflict will rightly be marked in a suitable fashion. This political decision is based on a failure to understand the equal importance of both events in European history. Recent announcements by the government regarding funding for the repair of Hougoumont farmhouse in time for 2015 do give some hope for a more enlightened attitude to the celebrations. Few today realise that the epithet ‘The Great War’ was used by the world to describe the Napoleonic wars, which culminated at Waterloo, for an entire century before 1918. The campaign in 1815 marked the end of twenty-three years of almost continuous pan-European warfare which touched every corner of the globe and could rightly be claimed to be the first real World War. The horrors of the 1793-1815 war led directly to a new type of politics within Europe with the emergence of the age of Congress. This presaged a century of relative European peace, within which numerous territory disputes and revolutions continued to flare, but the congress system did prevent these localised conflicts reigniting the entire continent in all out war. It must also be fully understood that the Napoleon, who is lionised today, would hardly be recognisable to almost anyone in 1815. Even within France it is clear that by this date, the majority of the population did not follow him with any form of joy or hope. Napoleon was never guilty of the inhuman crimes that Adolf Hitler and his henchmen unleashed upon the world more than a century later; but it must be recognised, that to the vast majority of Europeans in 1815, Napoleon was an insatiable war-mongerer; a despot; a criminal; a monster; or an ogre; in many respects he was the Idi Amin, or the Saddam Hussein of his day. Europe turned against him on mass and his defeat at Waterloo was the victory of a combined will over a tyrant with an untiring desire for expansion and constant war. This is what Waterloo stands for, but this message has been muddled over the intervening centuries because of the rebranding of Napoleon as a giant on the European stage and the complete obscuring of his tyranny. The beginning of the rise of dialogue instead of war and the first steps on the road of the great adventure known today as the European community; are the reasons we should celebrate the bicentenary of Waterloo in 2015. Kennedy correctly assumed that defeat spelt the end of Napoleon and also very astutely predicted that it would do more to keep historians employed than any other campaign in history. But clearly the British perception was already hardening into a view that, to paraphrase the Duke of Wellington, if they hadn’t been there, the battle would have been lost. Initial reports, both official and consequent press coverage, emphasised the cooperation of the Prussians and to a lesser extent of the Netherlanders, (Belgium and Holland then being joined together) in achieving victory. But soon, both the clamour from the British public for more details of the actions of their brave boys and the determination of politicians to win the subsequent peace dividend led to a rapid change in attitude. The valour of the Guards defending Hougoumont; the devastating and heroic charge of the British cavalry; the fortitude of the British squares and of course the culminating defeat of the previously invincible Imperial Guard by none other than the British Guards, all so ably led by the indomitable Arthur, Duke of Wellington, was the version soon glorified by the British press and gobbled up by a national wave of pride. The Germans, particularly the rising Prussian state soon realised that their efforts were in consequence being downgraded and their contribution diminished. Erstwhile allies were soon involved in petty squabbling regarding the failures of each other’s troops in battle and claims of perfidious dealings abounded. The distrust of the Duke of Wellington particularly by much of the Prussian Staff during the campaign led to accusations of dishonesty and treachery. His failure to support the Prussians at Ligny and his lack of support for the excessive Prussian reparation demands after the war led to accusations and counter accusations. The Dutch and Belgian troops were not treated well by the British press, as many of the British officers wrote severely critical reports of their actions during the battle. Accusations abounded of mass desertions and abject cowardice by elements of their forces. Again, counter claims were produced that their troops had actually preserved the position of Quatre Bras for Wellington and had been instrumental in the defeat of the Imperial Guard at the end of the Battle of Waterloo. Even the French muddied the waters, with supporters of Napoleon claiming that he had only been defeated because of the errors and betrayal of his marshals. At the same time, the supporters of the returning French King looked to cast the blame for every facet of the campaign squarely on the shoulders of the ex-Emperor alone. Napoleon, it has been claimed, was ill during the campaign, which is used as an excuse for his failings, but although he may have suffered from acute haemorrhoids the night after the Battle of Ligny, there is no real evidence to support the claim that he was actually ill at Waterloo. More likely he was guilty of being complacent. His army was certainly formidable but its morale was soon to be proven to be very fragile, certainly the political repercussions of defeat were simply unpalatable for Napoleon. Errors were made by all sides during the campaign and much has been made of them by their critics, but too often with the luxury of hindsight; however all great generals can make mistakes, but successful ones always take measures to prevent their errors from destroying them. These disparate groups therefore produced separate versions of the battle and campaign, with subsequent national historians developing and solidifying their own versions over the ensuing centuries. All sides are guilty of embellishment, of downplaying failures and even corrupting facts to fit their own version of events. Theories by these partisans are often based on inaccurate claims which have distorted the facts to verify their particular viewpoint on events. Poets and novelists have often turned to Waterloo as a theme for their work and even the events borne from their pen, particularly those of Victor Hugo, have also entered the public imagination and have taken the leap from pure fiction to perceived fact. Tales of the sunken road filling to the brim with the carcases of both cavalrymen and their horses, is such an example of literary over imagination, but it is now believed by many. Popular music has also played its part, for who is not familiar with the lyrics from Abba’s hit record of 1974 At Waterloo Napoleon did surrender? Which of course is a complete misrepresentation of the facts. Victorian Britain and the rising Germany were not exempt from extolling tales of valour or great fortitude pedalled to an eager nationalist public to demonstrate the bravery and stoicism of their forebears and which they expected would be emulated by succeeding generations. But their embellishment with each telling has led to a very corrupted version, myth and fable have somehow become established fact. It is also incredible that a plethora of first-hand accounts from all nations have been ignored by historians of the battle for two centuries. Too much emphasis in Britain, for example, has been given to the published Siborne letters, the official despatches and the score or more published memoirs which relate to the battle, with much reliance for evidence of the actions of the foreign units being based largely on the few books published by learned scholars of the late nineteenth and early twentieth century. However, a movement over the last decade to bring this multitude of forgotten sources into the public domain, has unearthed a great deal of information which does not sit comfortably within the ‘accepted version’ of the battle and campaign. Over five hundred previously unknown or at best little known witness statements from combatants of all nations, in the form of journals or simple letters to friends, family or professional colleagues, generally written very soon after the fighting when memories were at least fresh, have now been published for the first time in the English language. This sheer mass of new material, transforms much of our understanding of the campaign and gives a much more balanced view of the actions of the various nations engaged in this titanic struggle. Sadly, far too many of the books published to commemorate the bicentennial will still blindly follow this age old pattern. They will simply regurgitate the corrupted national versions with little or no attempt to square the differences of opinion or to incorporate any of this new information. This book has therefore been written with a very ambitious aim in mind. It is a collation of known evidence from all of the contending nations, to produce a true and fair representation of the campaign. It will show clearly the reasons why momentous decisions were made and give a faithful representation of the actions of the various forces involved. 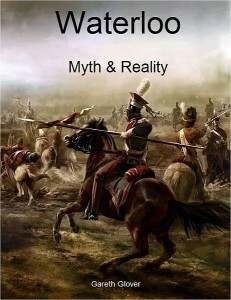 This work will clearly describe the reasons why the campaign occurred; the varying quality of the troops engaged and the wider sense of the campaign including a description of the often ignored twin battles of Ligny and Quatre Bras which actually had a significant impact on the course of the entire campaign for all sides. It will explain why Wellington stood at Waterloo and gives a full description of the momentous battle. But it will also deal with the devastating human and equine toll of these battles and describe the attempts to deal with the overwhelming numbers of wounded and how they dealt with the horrendous quantity of dead. Who has never experienced the tumult of battle cannot fathom the state of mind in a fighter who is engaged in a struggle for life and death with another man. All thinking, all feeling is consumed by the mad craving to strike down the enemy. All the muscles of the face are distorted. He hardly hears another’s voice, he does not feel the pain of a light wound. The campaign did not end with the Battle of Waterloo, for Napoleon could have reformed an army within France and fought on. Therefore the campaign to take Paris and, the fortress war that went on for many months after Napoleon’s abdication, along with details of his surrender and the peace settlement and subsequent allied occupation of France are all essential to a full understanding of this campaign and its far reaching consequences. This occupation by sector was actually used as a blueprint for the occupation of Germany in 1945. All of this will be described fully within the text which it is hoped can be read with interest by both novice and expert and that both will gain much from this narrative. Interspersed throughout the book are a number of framed boxes; these are intended to explain in far greater detail, the myths or errors that the general text can only allude to. These explain the truth behind them and are designed to avoid the great story being obscured too much by the detail. The reader may wish to read these boxes as they progress or simply ignore them to maintain the flow of the general text and refer to them later as they may wish. A large number of maps are also included to aid the reader’s understanding of both the grand strategy and the detailed battlefield movements. Therefore in returning to the words of Hyde Parker quoted at the very start of this introduction, there is much now, both to reveal and correct; this book it is hoped will satisfy this urgent need before next year’s bicentennial. It will cause controversy and will undoubtedly generate a great deal of discussion within the Napoleonic community and those with deep seated entrenched positions will cry the loudest. I have studied the battle for over forty years and I have done my best to tell the story as dispassionately and as accurately as possible. If they differ from expected and past views, then this has never been done purely for the sake of it, but based entirely on the evidence. You the reader will be able to decide whether I have succeeded in my aim or not.